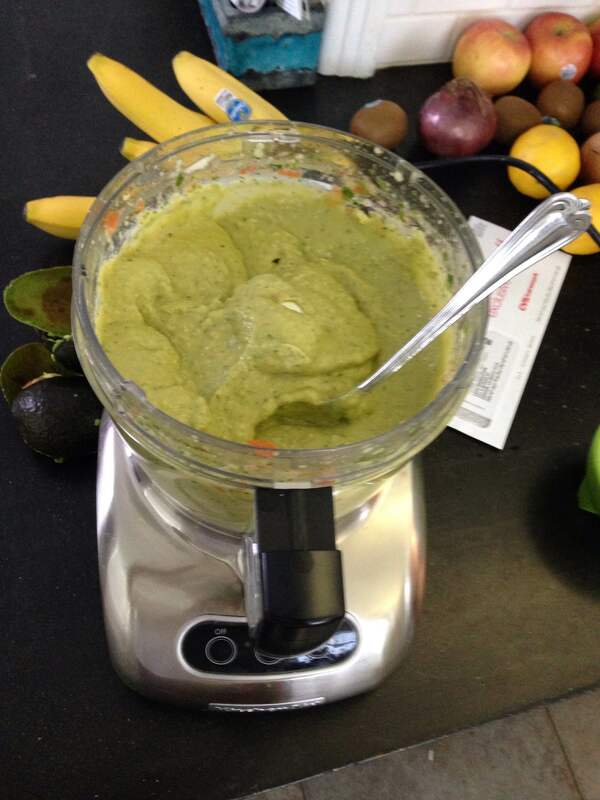 I Made Jack White’s Guacamole Because…Rock ‘n Roll!!! When I first heard “Fell In Love With A Girl” way back in 2002, I had no idea that people would still be talking about Jack White in 2015. I liked the song well enough, but I wrongly predicted that White’s career (and impact on the music industry) would be as lengthy as The White Stripes breakthrough hit. I was thoroughly puzzled by White initially. I remember seeing White creepily perform “Dead Leaves and the Dirty Ground” on Saturday Night Live and writing The White Stripes off completely. Look, we at Defending Axl Rose can’t all be right 100% of the time. Sometimes things slip by me. And don’t forget, when The White Stripes came on the scene there was a lot of strange rumors about Meg being Jack’s wife-sister…so you can’t blame me for dismissing them. I quickly corrected my view of The White Stripes when the band released ELEPHANT in 2003. When Mojo magazine declared it the band’s “British” album, I quickly went out and bought it on CD and red-and-white colored vinyl. That’s right, I dropped $45 on the album before I’d even heard “Seven Nation Army.” ELEPHANT was rousing, epic rock album that blew me away and immediately made me a fan and follower of White. I still think he’s weird (sometimes a little too much for his own good), but he’s the closest thing my generation has to a true rock god. 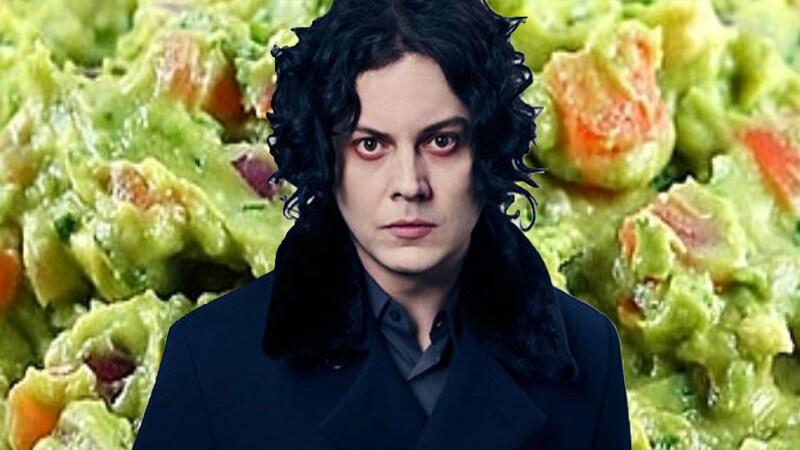 Oh my God, stop reading and go do a Google image search for “Jack White Guac.” Seriously. I’m still heartbroken that The White Stripes are no more, if you want to know the truth. I like The Raconteurs and love The Dead Weather, but I miss those glory days of red-and-white albums. White’s solo records haven’t really done much for me, but to tell the truth I’ve never really given them much of listen. White has given me so much over the years, I really owe it to him to sit down someday and study both BLUNDERBUSS and LAZARETTO in depth before writing them completely off. Anyway, like the rest of you, I have been breathlessly following Guacamole-Gate, the dip-themed scandal that has embroiled Jack White these past few weeks. For those of you living under a rock, here are the basics: Jack White played a concert at the University of Oklahoma earlier this month. The school’s newspaper used the Freedom of Information Act to acquire the contracts involved with the concert. These documents were published in the school paper and revealed the amount of money the school paid to have White perform, as well as White’s tour rider. While I was a bit surprised it only cost the school $80,000 to have Jack White perform, the press (small and large) have jumped on the tour rider which included a recipe for Jack’s guacamole. Ah, tour riders. Do these things ever not make an artist look crazier than a bag of cats? The purpose of tour riders is to ensure that bands and their staff are comfortable while setting up and waiting to perform a gig. Let’s face it: being a traveling musician is not fun and glamorous. Can you imagine sharing one bathroom with everyone in Metallica? Or splitting a meal with Wolfgang Van Halen*? Then there’s the small army needed to setup and tear down even the most modest of stages. Tour riders ensure that these hardworking folks get all the brown M&M’s they so desperately need. Speaking of brown M&M’s, the most famous rider in all of rock history is the Van Halen rider that specified that the band have a large dish of only the brown colored candies. This demand made the band poster children for rock excess, but over the years Eddie Van Halen has claimed that his odd request was made out of safety! According to Eddie, the band used this request to judge how compliant venues were with all of their requests. If the brown M&M’s weren’t done right, the band reasoned, then maybe the super dangerous lighting rigs weren’t done correctly either. I hate to side with Eddie (because agreeing with him stokes his ego) but the dude has a point. 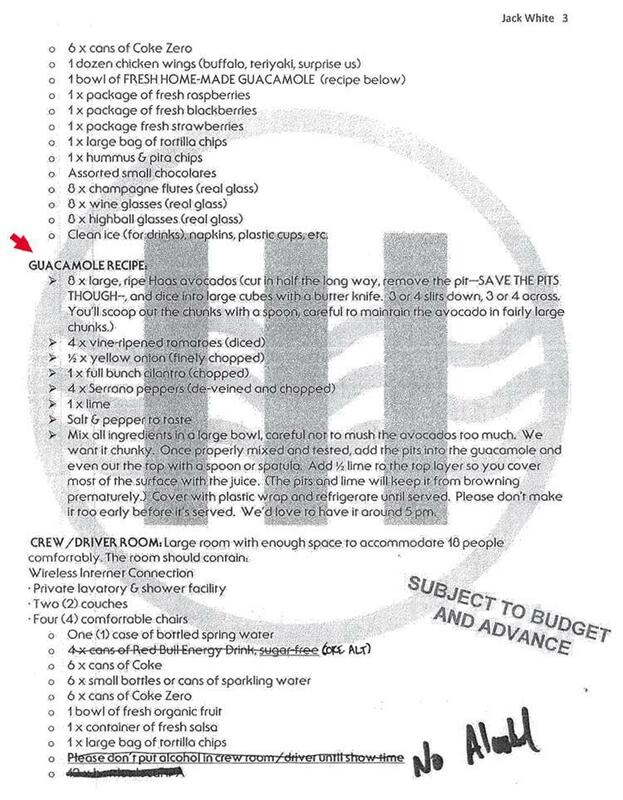 Jack White’s rider requested that the venue make a bowl of homemade guacamole and included details instructions on how to make it. These instructions are Van Halen-specific, going so far as to tell venues what sort of knife to use on the avocados (a butter knife, presumably to avoid smooshing the soft fruit). 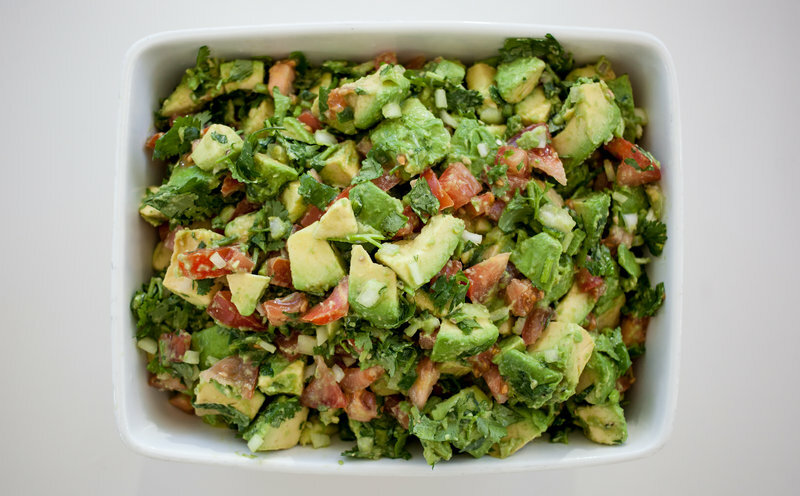 The recipe even includes instructs venues to use the avocado pits and lime juice to prevent the guacamole from browning. When the rider hit the interWebz, the music world was shaken to the core. So much ink was spilled over this non-story that earlier this week, Jack White issued a long, semi-rambling statement about this rider. Essentially, he was sick of being asked about the whole affair and chastised the student reports for making something out of nothing. White’s management group issued a statement saying that White and their other artists would be boycotting the University of Oklahoma because of this incident. Of course, White had nothing to do with that particular decision. He even went so far as to say that he’d forgiven the student reporters and holds no ill will towards Oklahoma. Great. So first The White Stripes break up forever, and then I find out Jack White can’t even make the most basic of party dips. What’s next, Bono will never be able to play guitar again? I know I’ll never be a musical genius like Jack White, but if I realized that if I could make this guacamole then there would be one area where I’d have him beat! Thus, I decided to use the recipe to make his manager’s dip. I went to the store and acquired the ingredients necessary for this magical rock ‘n roll creation. Then I rolled up my sleeves, put on some White Stripes, and got to work. So how was it? Well, if you follow the directions to the letter, you end up with something less like a dip and more like avocado salad. Sorry, Jack. 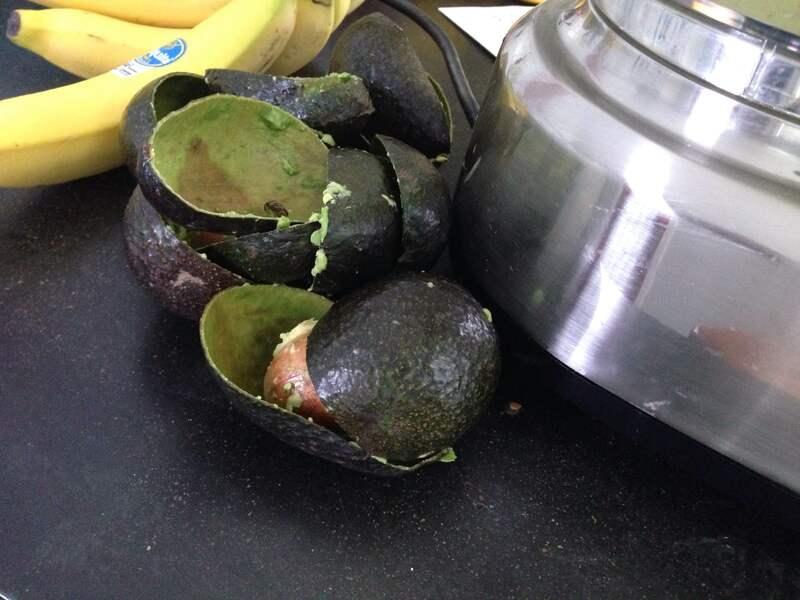 That isn’t how I like my guacamole. I’ll be honest, I fully intended on following the recipe to the letter, but I couldn’t abide such hippy-dippy gauc. Also, I’m really lazy. It was so much easier to just shove everything into my food processor.So that’s what I did. The results, while not 100% Jack White approved, was still pretty stellar. The serrano peppers added just the right amount of heat. I love spicy foods and this dip didn’t let me down. 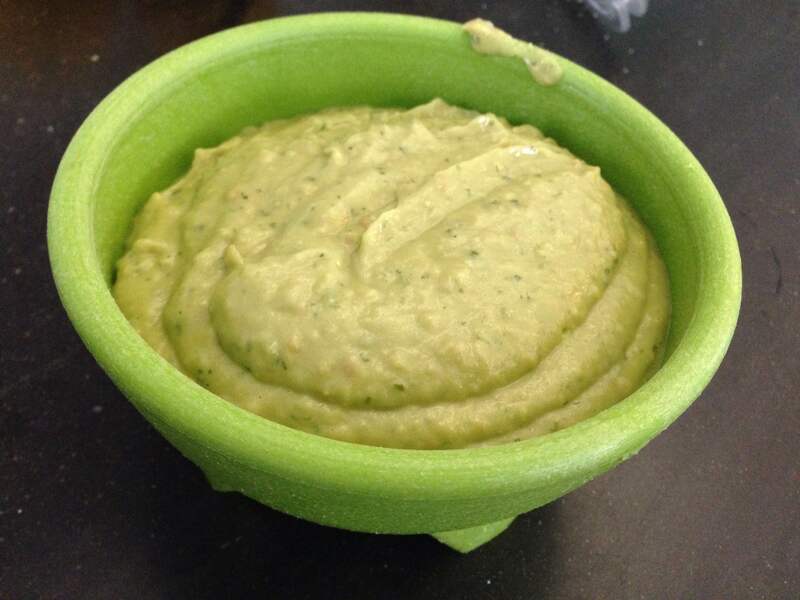 I would like to add that if you plan on making this dip, be sure to have a hungry crew of guitar techs coming over–the recipe yielded a ton of guacamole. *I bet you thought I’d gotten over making fun of Wolfgang. You thought wrong.